Mud rendered walls; wood beamed ceilings; Gulf waters dotted with date palms; Hookah stalls- Sheesha-flavoured tobacco; Exotic Arabic and Indian food; Pet shops with aquariums birds, bunnies and even cats and roosters; Souq- Market of Wakra-Doha. Don't we all look forward to the small weekend evening outings? A place so close by to our residence, enchanting, easy eatery availability, peace and what more? 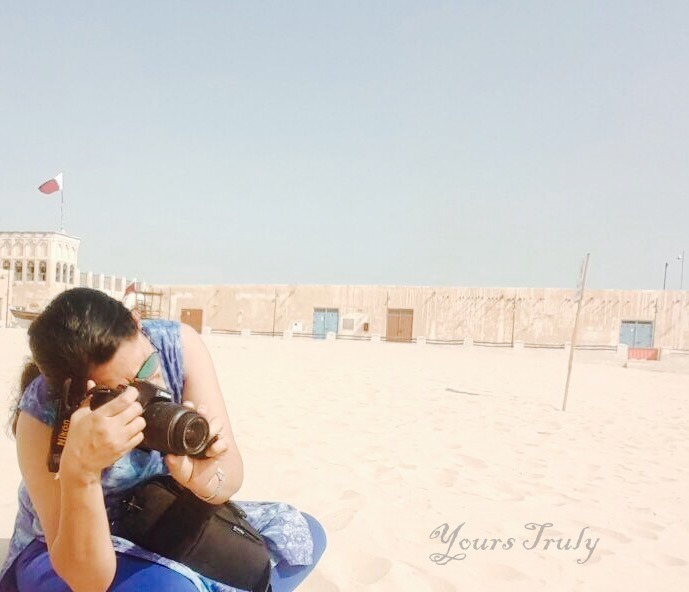 Well, the Corniche in the Souq of Wakra, (in Doha, Qatar) is just one such place. A peaceful weekend spot. Although one could spend few hours there. Especially when we chose nature and some fun. Nature fills our hearts with awe by it's spectacular ways. Food to fill your heart's and stomach content without disturbing the major balance of your wallet! Watching sunrise here is a charm. What a luxury it will be, sip your coffee, get to the corniche in like 10 minutes, watch the sun rise, lying on the cold sands and return home for a cheerful day to follow. Does it not sound exciting? It was this trip of mine that finally drew me to write this so I could share it with you all. Qatar has maintained it's polished beauty. Though it is just like a thumb off traditional Saudi Arabia border, the tradition has steeped off a little to meld with modernity. The old markets called Souq is a perfect soak up of tradition. The Souq of Doha has been there since the times the Beduion traders bartered sheep, goat, camel and wool for materials required for their living. Exotic aroma of spices, numerous flavours of tea, unending stalls of shawarma ( Arabic Food ) and other Arabic food charm up the lane parallel to the corniche. Don't expect the waves in the sea here. Still beach and a beauty of it's own. How does it feel that you reside just across such a spot, drive for 10 minutes and reach corniche. Moreover, in the cold winter of Doha with temperatures like 10 degrees Celcius it's a feast to be in such a spot. Nature can never stop entertaining you, inspiring you, nail you up to be fresh and positive always. We stand captivated by the blue waters. the molten gold coloured sand, the sky forming myriad colours playing with the sun, spell bound and we realize the real awe of nature.